Funeral services for Chaplain Billy D. Dunn, 81, of Lufkin will be held Friday, May 4, 2012 at 1:00 p.m. in the Carroway Funeral Home Chapel with Dr. Andrew Pittman and Dr. E. Aubrey Knox officiating. Graveside services with military honors will be held Monday, May 7, 2012 at 9:30 a.m. in the Fort Sam Houston National Cemetery in San Antonio. Billy D. Dunn was born early on the morning of October 4, 1930 in a little South Texas town dubbed George West, at home, to Drew Albert and Alta (Wyatt) Dunn. He was soon nicknamed "Bill". From the time Bill was born, until he graduated from high school in 1948, the family had moved nine times over Texas, New Mexico and Arkansas, and he had attended seven different schools. Little did he know that the move from Fort Worth, Texas to Arkansas his senior year in high school, where his father bought a small cattle ranch near Black Spring and Norman, Arkansas, the school year 1947-48 would be the beginning of some life-changing events. For the first time he played on a high school varsity basketball team for Norman High School (because of bone surgery the doctor had said that he should never play varsity sports, but he did his senior year anyway). From that one year of playing experience he received a basketball scholarship to Ouachita Baptist College (now University). So, in the fall of 1948 he enrolled as a freshman at Ouachita in Arkadelphia, Arkansas. 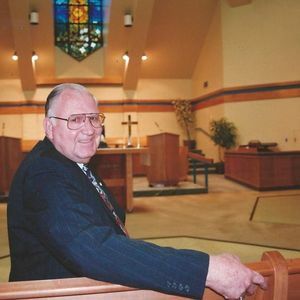 During his college years he was licensed to preach by the First Baptist church in Norman, Arkansas in 1950 and was ordained in the Gospel Ministry by the Second Baptist church of Arkadelphia in 1951. Upon graduating from Ouachita in 1952, where he was an ROTC cadet, basketball player, ministerial student and student pastor to two half-time rural churches in Brownstown and Pattsville, Arkansas, with an English Literature major and Bible minor, he enrolled in Southwestern Baptist Theological Seminary in Fort Worth, Texas that fall. While attending seminary, he spent the summer of 1953 as a student missionary to the Bahamas (Islands), he pastored the Lee Baptist Church near Big Spring, Texas. During his senior year at the seminary he became a Chaplain Candidate (2LT) in the U.S. Army Reserve. At graduation in 1956 he entered Extended Active Duty for his first tour as an Army Chaplain (1LT). In all he spent 35 years in the United States Army Reserve, with 17 1/2 years on active duty including a sixteen month tour in Korea; a thirty month tour in Germany; and a nineteen month tour in Vietnam. In between his tours in Korea and Germany he met Beverly Anne Davidson. They were married February 5, 1960 in her home town, Houston, Texas. During the next eight years, with moving about to assignments at Fort Hood, Texas, Germany, Vietnam and Fort Sam Houston, Texas, five children were born: Marion Kay, Glenda Pauline, James Drew, Karen Anne, and Timothy Wayne. All were born in military hospitals except Karen who was born in Houston six months after her Dad was stationed in Vietnam. James was born in the U.S. Army Hospital in Stuttgart, Germany. In the fall of 1972, after graduating from the U.S. Army's Command & General Staff College in Fort Leavenworth, Kansas, Chaplain (Colonel) Dunn left Active Duty and returned to active reserve status, serving in reserve units at Little Rock, Arkansas, Shreveport, Louisiana and Houston, Texas. Chaplain (Colonel) Dunn retired from the United States Army Reserve Program on October 4, 1990 at age 60. The Veterans Affairs (VA) awarded Chaplain Dunn a 100% disability due in part to the effects of being exposed to "Agent Orange" while serving in Vietman. For a time he served as chaplain at the Arkansas State Training School for Girls (Reform School) at Alexander, Arkansas, near Little Rock. Then on October 15, 1972 he moved back to Texas (Lufkin) when he accepted the position of chaplain at the Lufkin State School, Texas Department of Aging and Disabilities Services (DADS). After 34 years, 2 months, and 16 days, at age 76, he retired from the Lufkin State School on December 31, 2006. During his rather lengthy and intermittent years of academic pursuits he earned two Bachelor's Degrees, three Master's Degrees and a Doctorate: Ouachita Baptist University, BA 1952; Southwestern Baptist Theological Seminary, BD 1956; M.Div 1973; MRE 1978 (July); D.Min 1981; and Stephen F. Austin State University, M.Ed (Special Education) 1978 (December). He completed two full years of Clinical Pastoral Education (CPE): Institute of Religion, Texas Medical Center, Houston, Texas, CPE I (Basic course) 1959 & CPE II (Internship) 1960; and Center for Clinical Pastoral Studies, Memorial Hospital System, San Antonio, Texas, CPE III (Residency) 1970. He was a Board Certified Chaplain in the College of Chaplains (changed to Association of Professional Chaplains [APC]) and was board certified by the Religion and Spirituality Division of the American Association on Mental Retardation (AAMR). Chaplain Dunn died May 1, 2012 at Hospice in the Pines In-Patient Care in Lufkin. He is preceded in death by a sister who died at birth; his parents, Drew Albert and Alta Wyatt Dunn; his sister, Sara Opal Dickson Bristow; his older brother, John Dee; his youngest brother, Glen Albert; and his oldest daughter, Marion Kay Dunn Holland McClure. He is survived by his wife, Beverly Anne Davidson Dunn of Lufkin; their two daughters, Glenda Pauline (and Kevin) Kelley of Lufkin, Karen Anne (and Michael) Braun of Tallahassee, Florida; two sons, James Drew (and Andrea) Dunn of Friendswood, and Timothy Wayne Dunn of Austin; one son-in-law, James McClure of Oakhurst; three nephews, Lewis Wyatt (and Mary) Dickson of San Antonio, Hartsel Taylor Dickson of Austin, and John Michael (and Christy) Dunn of Dallas. Carolina, Nicholas Ryan Kelley of Nacogdoches, Michael Albert Braun III (Trey) of Atlanta, Georgia, Lauren Kathleen Kelley of Lufkin, Parker Davidson Braun and Joshua Hunter Braun of Tallahassee, Florida. Three great-granddaughters, Adrianna and Jacqueline Herrera of Conroe, Mia Grace McClure of Little Elm; and two great-grandsons, David Herrera, Jr. of Conroe and Carter James McClure of Little Elm. Chaplain Dunn was a member of the First Baptist Church in Lufkin, Texas. The family will welcome friends and loved ones from 5:00 to 7:00 p.m. Thursday evening at the funeral home. Proudly served God and Country. Your family will remain proud of you for your dedication and love for the USA! I loved to attend the State of Texas Chaplain's workshop with Billy. I remember that he always requested a single room and paid the extra to be able to stay by himself. I always thought that it was strange that the other chaplains who had attended longer than I had tease Bill about his snoring while asleep. He told me personally that that was why he requested a private room, not because he was anti-social. I had the privilege of staying in a room next door the last year he attended and I understood. Loved the workshop, loved Bill, but I didn't get much sleep that week. My prayers are with the family and friends; those of us who are grieving out here in the trenches will miss him greatly too. sweet and loving rembrances of this remarkable Godly man. do so miss them, as well as my husband Bob who joined them in 2001.
ways, Allow Him to shower you with His blessings. With Loving Thoughts and Prayers, Margaet M.
I have fond memories of Chaplin Dunn. He was truly dedicated and a sincere hard working person who deeply cared about people. My prayer for his family is that God will strengthen and comfort each of you as only He knows what you stand in need of. It was a pleasure knowing Chaplin Dunn. May Chaplin Dunn's legacy live on through you-his family...he was a good man!